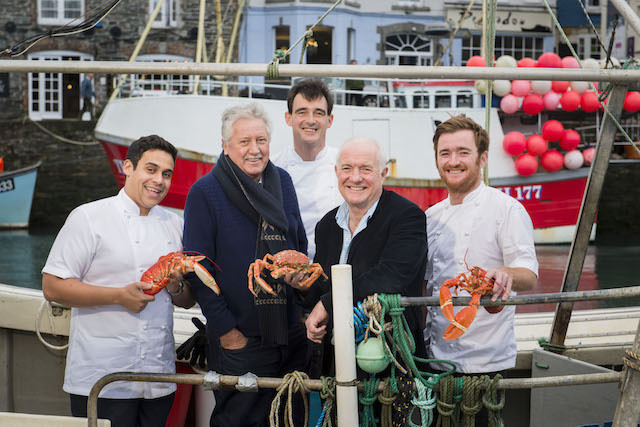 This year sees the Padstow Christmas Festival returning to the popular fishing town on the north Cornish coast for the eighth time. 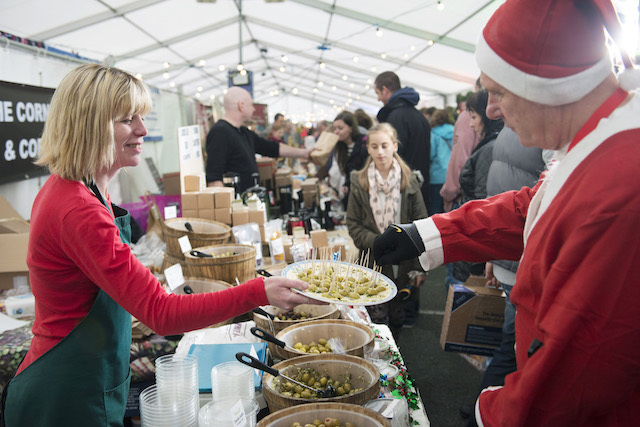 From Thursday 3 to Sunday 6 December 2015, Padstow will be awash with festive food, celebrity chefs and happy shoppers. The festival is free to attend. 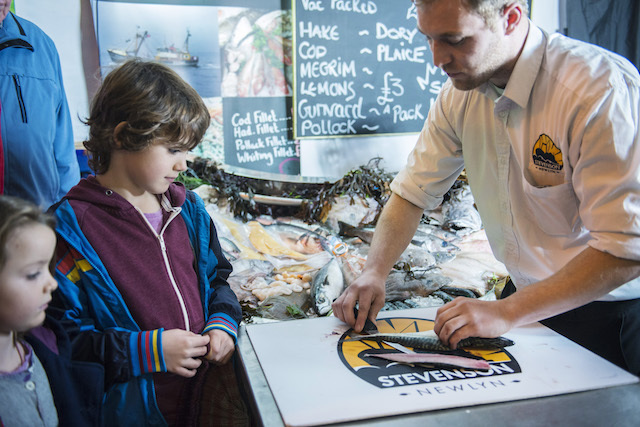 The 2014 event won the accolade of “Tourism Event of the Year”, winning gold in the Cornwall Tourism Awards, and over 45,000 visitors are expected again in 2015. 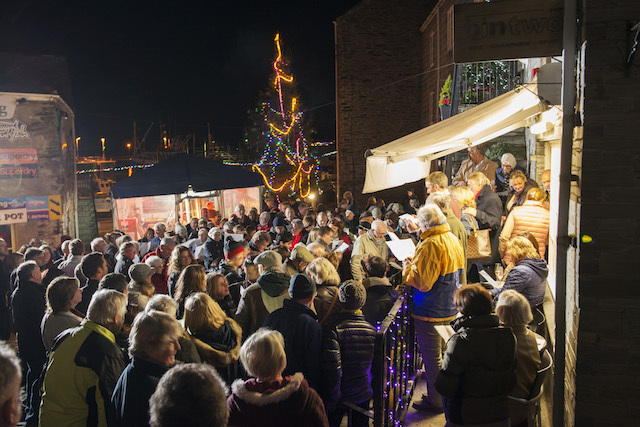 The festival website (www.padstowchristmasfestival.co.uk) has a comprehensive timetable, map and practical information about the event, but we’ve selected our top ten not-to-be-missed highlights. One of my favourite parts of the festival is the Friday evening, when it feels like Christmas celebrations have really begun. 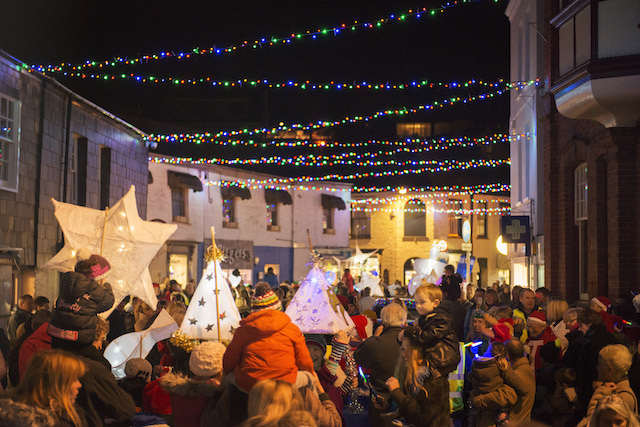 The lantern parade kicks off at 6pm, with carol singing outside binTwo at 7pm, and the evening culminates in a spectacular firework display over the harbour at 8.30pm. The food stalls in the Christmas Market are definitely best visited when hungry so you can make the most of the samples. With so much on offer, from cookies and ketchup to Stollen and sausages, you can guarantee that you won’t be leaving empty handed. And with the huge array of drink producers there too, you’ll need a strong shopping bag. So far on my shopping list: Da Bara Bakery‘s crack pie, a large tub of Cornish Sea Salt, scallops from Stevenson and Cornish Orchards‘ apple juice. It’s not all about food! You’ll be able to find plenty of Christmas gifts for your less gastronomic friends in the Christmas Market marquee. Over thirty (mainly Cornish) artists and artisan producers will be displaying their wares – jewellery, china, toiletries, toys, clothes, homewares, handbags, art and books amongst others. I particularly like the look of Wigglefish, Atlantic Blankets and Cornish Magpie. 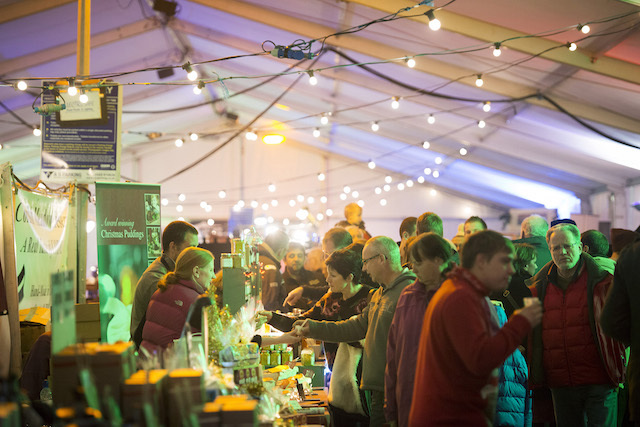 The festival food forums are hugely popular and take place on the main stage in the Sharp’s Chefs Theatre. I’m looking forward to seeing Jill Stein and her three sons on the Friday afternoon, where they will be providing an insight into 40 years of The Seafood Restaurant. 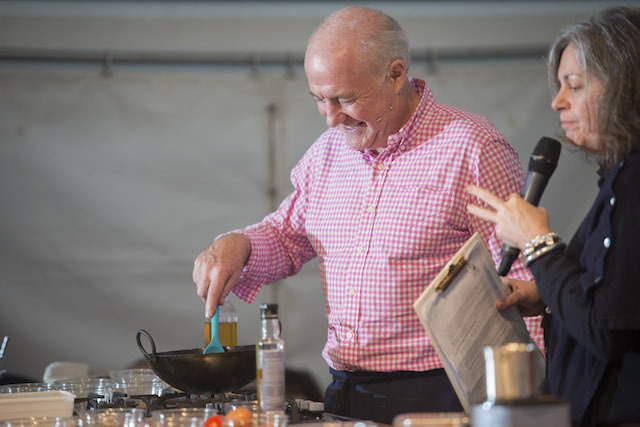 Food writer Xanthe Clay and Rick Stein will be debating the latest food trends on the Saturday and Brian Turner will host the ‘ask the chefs’ session on Sunday. There are some superstar chefs in the line up, and if you don’t get a chance to watch their demos, then you’re more than likely to bump into them wandering around the marquee or enjoying themselves in town. If you’ve got one of their cookery books with you, then you may be able to persuade them to sign it for you. Selfies obligatory. Nathan Outlaw kicks off the demos at 12 noon on the Thursday, and then there’s a relentless stream of big names from the culinary world, including Angela Hartnett, James Martin, Richard Bertinet, Rick Stein, Paul Ainsworth, Gizzi Erskine, Brian Turner, Antony Worrall Thompson, Michael Caines, Peter Sanchez-Iglesias, Ashley Palmer Watts, Simon Hulstone and Mitch Tonks. Bagsy a seat in the front row. See the full Sharp’s Chefs Theatre timetable. NB some demos will be ticketed so it’s worth getting there early. For many people, local chefs are their friends, bosses, customers or heroes. The Festival Kitchen is a smaller theatre and hosts another outstanding selection of demonstrations. Those on stage include Ben Quinn, George Pascoe, Tristan Stephenson, Adrian Oliver, James Nathan, Mark Puckey, Barry Horne, Emily Scott and Christine Jensen. See the full Festival Kitchen timetable. With all the festival action going on in the marquees, you could be forgiven for forgetting about the shops, cafés and restaurants in Padstow itself. Don’t forget to book a table in advance if you fancy lunch or dinner in a restaurant. Try Number 6, Rojano’s, Prawn on the Lawn, one of Rick Stein‘s establishments, or Burger and Fish amongst others. 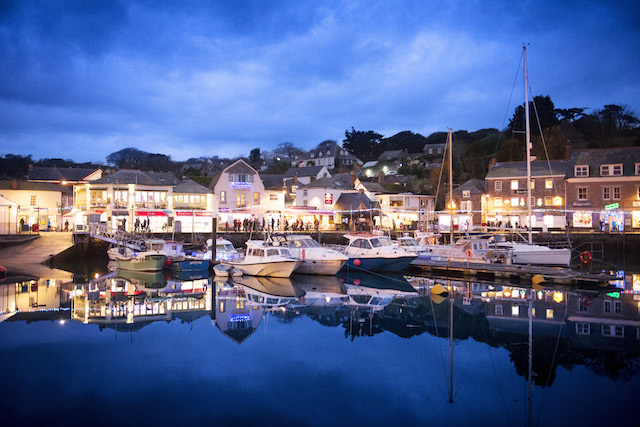 You’ll get plenty of retail therapy here too; our favourite shops include binTwo, Buttermilk Fudge, Teri Walter’s W, The Drang Gallery, The Padstow Mussel Co. and Bibi. 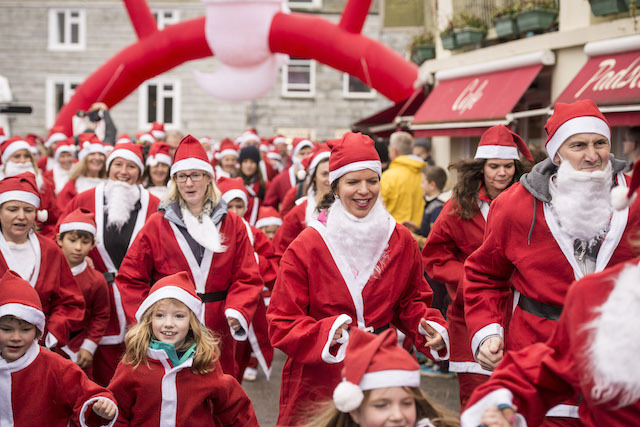 On the Saturday morning, hundreds of competitors are expected to take part in the Fun Run and Cycle with participants choosing whether they represent Team Santa or Team Rudolph, all in aid of Cornwall Hospice Care. The 6 mile cycle sets off from Wadebridge to Padstow at 10am, and the 1 or 2 mile fun runs begin at 1pm. Entry to the fun run or cycle costs £12 for adults and £7 for children, or £15 for adults and £10 for children to do both. Return bike hire from Wadebridge is included in the price of the cycle and is kindly provided by Bridge Bike Hire. Spaces are limited, so advanced registration is recommended. For more information and to sign up click here. If you’re having too much fun to stop to eat, then grab something from one of the many street food vendors who’ll be in Padstow for the festival. 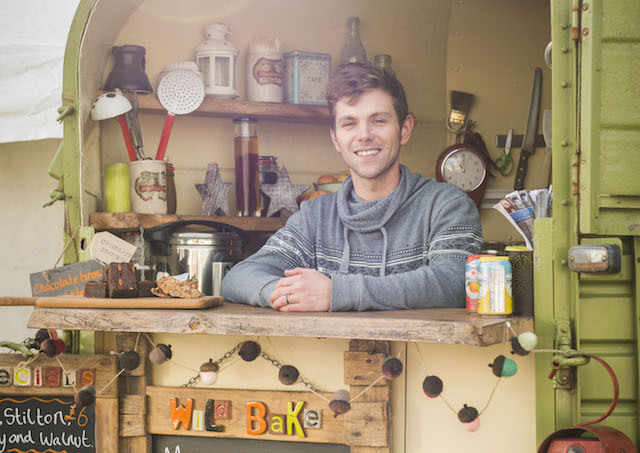 Don’t miss Wildbake, Inkie’s BBQ, Kernow Sausage Co., and others in the town, plus various food stalls within the marquee, including The Cornish Crepe Co., Big Pan Parties and Kaloura’s Kitchen. If you’ve been inspired by a chef demo, a conversation with a food producer, or a recipe you’ve picked up along the way (don’t forget to buy the Padstow Festival Cookbook), then the market is the perfect place to buy the ingredients to cook in the comfort of your own home. Most stalls will happily look after your purchases for you, and keep fresh produce cold, but don’t forget to pick them up before you leave! Please share with us your pictures on social media, using the hashtag #PCF15. 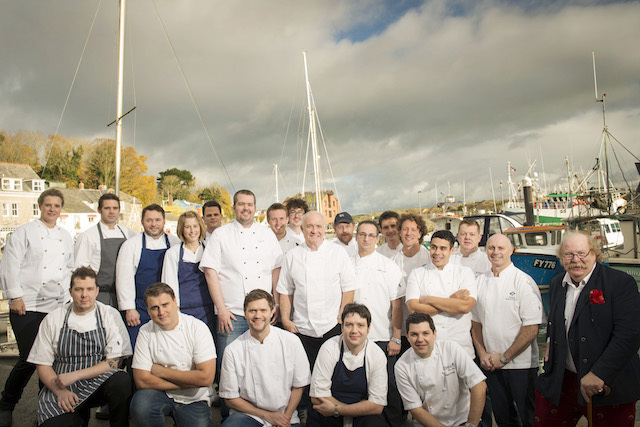 For more information visit www.padstowchristmasfestival.co.uk.